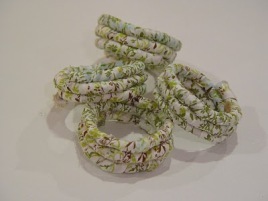 Vanessa from Punkin Patterns shows how to make these funky scrap fabric napkin rings, no sewing required. If you have some scraps left over from a placemat or other table decor sewing project, this would be a fun way to make some coordinating napkin rings. Get the tutorial.